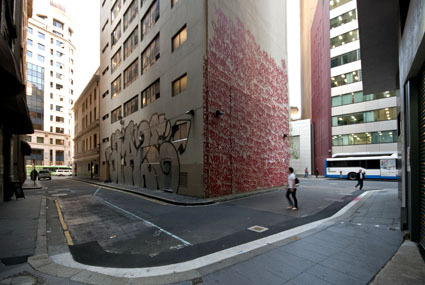 Barry McGee's wall painting in Bond Street teeters between the free spirit of street art, the random energy of the urbane, and the pure intent controlled artistry. Fusing together found and invented imagery, tags and assorted objects Barry McGee draws on a range of influences including the Mexican muralists, tramp art, the graffiti artists of the 70's and 80's and the San Francisco Beat poets to create a unique visual language. 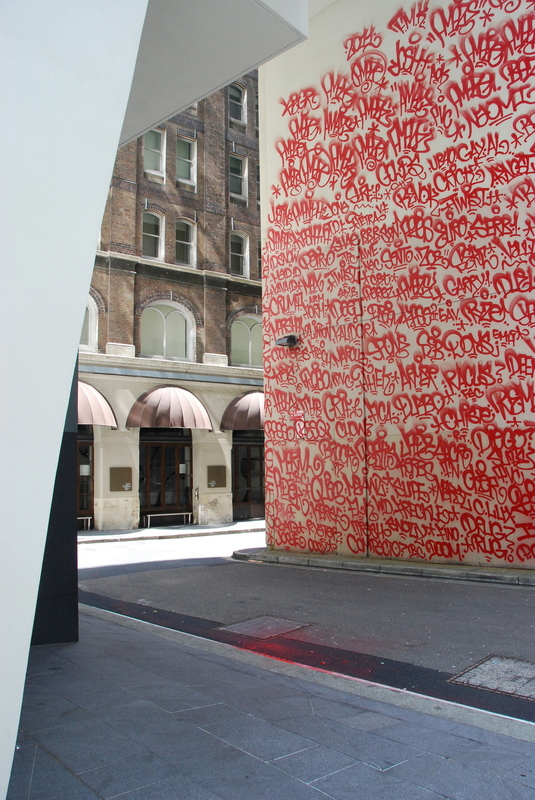 Being involved in Sydney's Laneway Project offers the artist the opportunity to bridge the divide between his street art and gallery practice. McGee's Bond Street mural is enormously poetic and evocative. An immediate visual signature of the best street art. Not only a wall painting, McGee's piece also functions as personal mark, emphasizing his presence not only in the art world but also on the street. His piece is composed of large letters that spell out the words "Josh" and "Twisters," both names that appear frequently in McGee's work, and are instantly recognizable to his international audience. The size of the letters makes it impossible for one to read the name close up, and the letters become large, bubbly abstractions. It is only from far away that one can read the complete names. This forced perspective not only encourages the viewer to interact with the art, but also to be part of the action on the street.